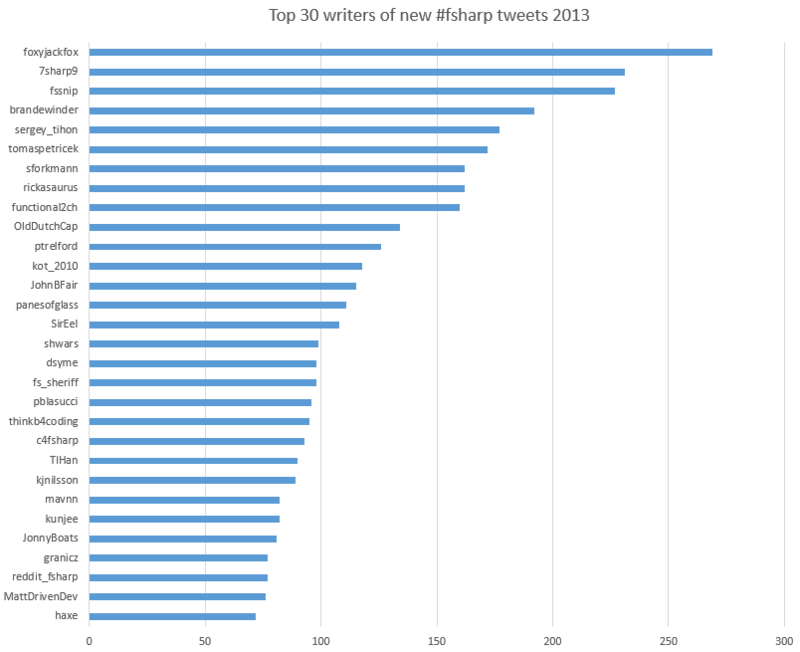 Previously I have published statistics about #fsharp twitter hashtag. This one is based on the tweets that I collected throughout the whole 2013 year. Every week while working on the F# weekly I have downloaded all tweets with hashtag #fsharp and pushed them to my local MongoDB. 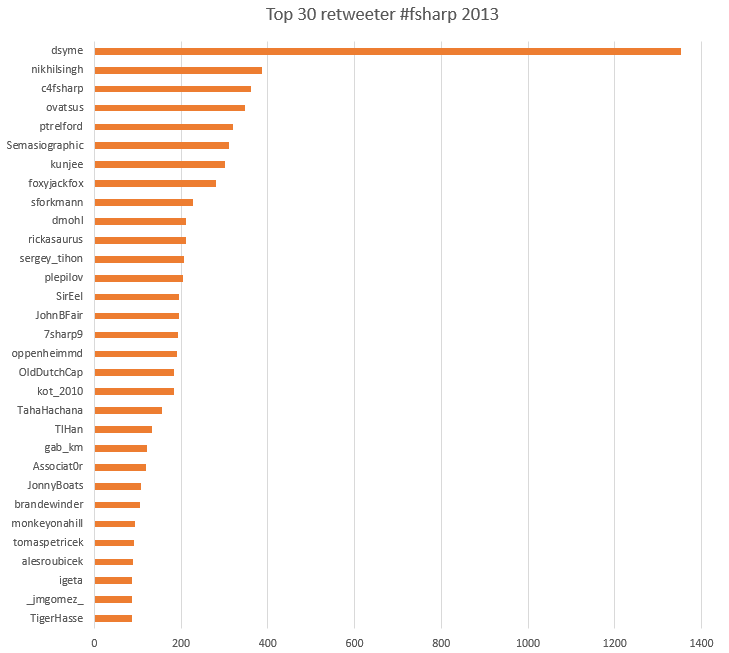 I managed to collect about 24000 tweets from more than 3000 twitter users. 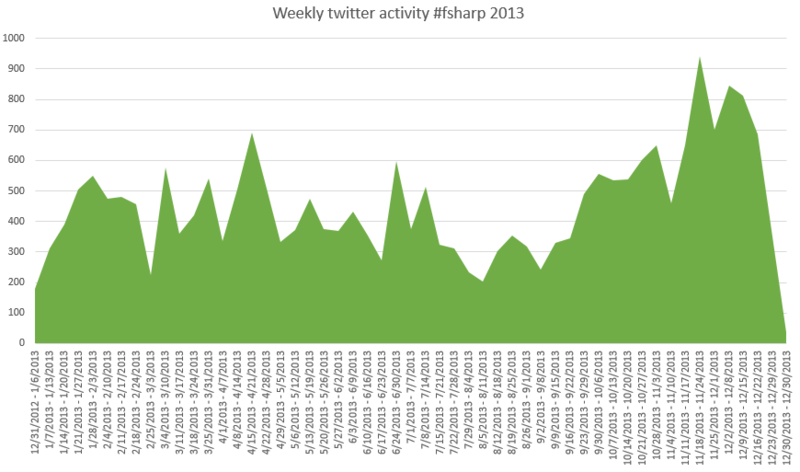 The first picture on the top of this page is based on total twitter activity around #fsharp hashtag. The size of twitter names depends on sum number of people tweets and retweets. Other charts are self descriptive. Thank you guys for your effort, let’s make 2014 even better. I want to say thank you to all of you. Thank you to everyone who have been with us all this year and read F# Weekly. Thanks to everyone who blogged about F#, contributed to F# projects and wrote tons of awesome source code and documentations. 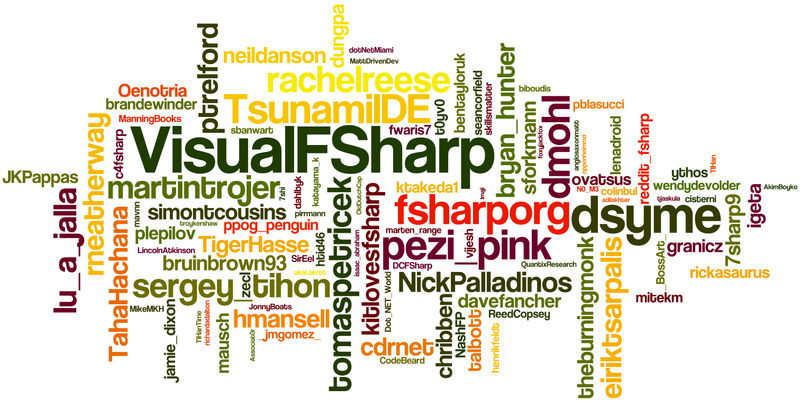 Thanks to everyone who made a lot of awesome F# talks this year and dramatically improved F# public presence. Guys, you are awesome! “F# Compiler & Interactive Services“(codename Foslyn) were released!!! New Stanford NLP for .NET site was released. “Try F#—Data Console to Big and Broad Data” is the most readable blog of Microsoft Research Connections! TsunamiIDE proposed to embed F# into your blog or website today with Cloud Tsunami. raml.org is a new Type Provider challenge. Will Smith works with MvvmCross on F# (WPF test app). CodeMaid writes that they support F#. “New Angular.js Option in the F#/C# MVC 4 SPA Project Template” is one of the most viewed posts in Daniel Mohl blog in 2013. New F# book in German: Learn F#, Kata by Kata, from Ralf Westphal. Ross McKinlay blogged “SQL Provider – new stuff including PostgreSQL support and option types!“. Tomas Petricek posted “Advent Art：北斎の絵を生成する“. Jamie Dixon wrote about “Screen Scraping College Football Statistics“. “Simple.Web F# Project Template – Part 1“. “Simple.Web F# Project Template – Part 2“. 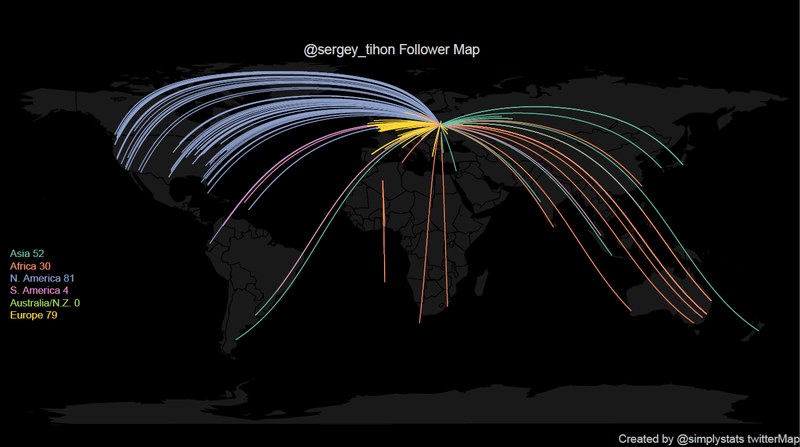 Sergey Tihon blogged “Twitter Followers Map with RProvider“. Chris Skardon wrote “Using Neo4j with F# – Cypher 2.0“. Natallie Baikevich posted “Log(music) with Undertone“. 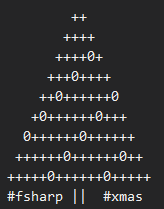 Ollie Riches blogged “Simple F# REPL in WPF – part 3“. That’s all for now. Happy New Year and see you in the New 2014 Year! New WebSharper site is finally out with new samples: HighCharts, D3js, O3D and etc. Steffen Forkmann announced FSharp.Management (FileSystem, Registry, WMI and PowerShell). F# compiler & interactive services (codename Foslyn) now have basic documentation! Preview F# support at Xamarin! Learn how Microsoft and partners are using F# for Spatial Data Research Software (read more). “F# type provider for Amazon S3” by Yan Cui. “Expression Oriented Programming with F#” by Robert Pickering. “Dependent Type Providers” by David Raymond Christiansen. “Effective Quotation – Relating approaches to language-integrated query” by James Cheney, Sam Lindley, Gabriel Radanne and Philip Wadler. “On Building Software” with Bob Martin. “Deconstructing Functional Programming” by Gilad Bracha. Daniel Mohl updated “Adding New Items to a Pure F# ASP.NET MVC/Web API Project“. Mike Harris posted “Living with Function Programming OR Unit Testing F# with FsUnit“. “Simple F# REPL in WPF – part 1“. 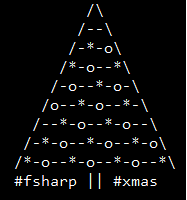 “Simple F# REPL in WPF – part 2“. Karl-Johan Nilsson wrote “How Agents Fail“. Victor Baybekov wrote about “Monte Carlo Pi“. Ayende Rahien posted “What about F# collections?“. Jamie Dixon blogged “F# and Monopoly Simulation Redux“. Steffen Forkmann posted “Microsoft Dynamics NAV type provider“. Daniel Mohl wrote “Getting Started with Azure, Node.js, and FogJS on Windows“. Krzysztof Cieślak blogged “F# Type Inference“. James D’Angelo shared “Pure F# ASP.NET Web Applications and Simple.Web“. Kit Eason posted “What to do if you ‘just don’t get’ F#“. Sergey Tihon blogged “F# Kung Fu #1: Mastering F# Script references“. Dave Fancher wrote about “Fibonacci Sequence“. Gene Belitski posted “Quieting FSI output“. F# jumped to 20th place of TIOBE index. Doing F# in free time? Start a new open source project from FSharp.ProjectScaffold template! New (version 4.0.4) fszmq is released with shiny new website (fszmq has been officially accepted into the ZeroMQ community organization). Phillip Trelford presented Resource File Type Provider (BitBucket repo). Yan Cui presented Amazon S3 Type Provider. Ross McKinlay presented new SQL Provider. New FsPickler performance test results became available. LinqOptimizer 0.4.1 is on NuGet for F# and C#. FsLab is not a myth anymore! C# 6.0 looks more and more like F# with nulls. With NAudio, F# and Excel Kit Eason can produce a graph of what a plucked guitar string is doing. 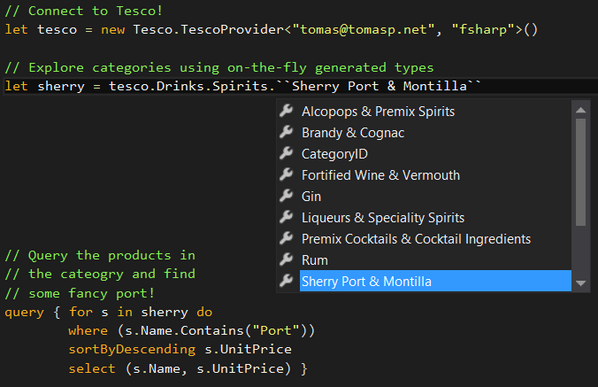 New features for Azure type provider are welcome. WebSharper 2.5 is available on NuGet. F# MVC 5 project template already available. “Doing Data Science with F#” by Tomas Petricek. Nikos Baxevanis posted “Semantic Equality Comparison in F#“. Daniel Mohl wrote about “A Few Other Template Additions and Changes of Interest“. Ross McKinlay blogged “The Erasing SQL type provider (codename John)“. Dmitry Sevastianov wrote “Simple bond valuation“. “F# > C# when doing math“. “The Big Ten and F#“. Tomas Petricek wrote “Understanding the world with F#“. Michał Łusiak posted “Using redis with F# on Windows“. 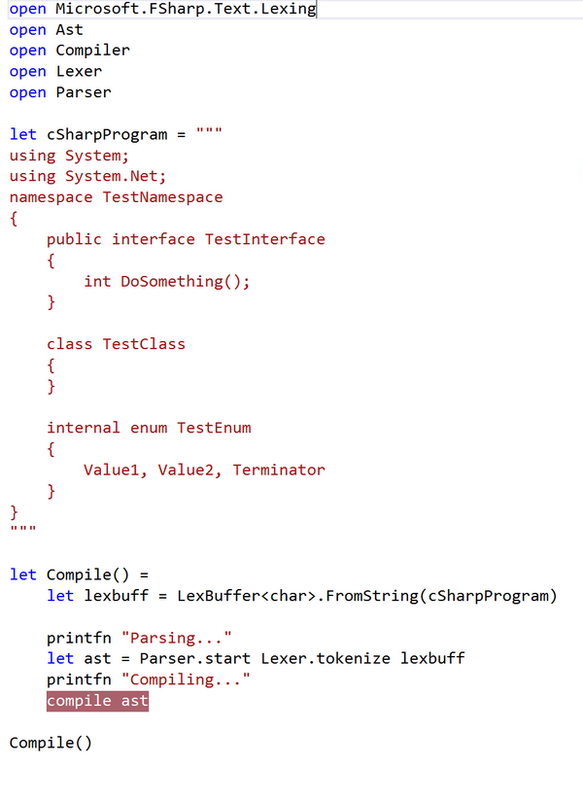 Craig Stuntz blogged “Let’s Build a Compiler… In F#!“. Steve Gilham shared “An introduction to Functional Programming in F# — Part 2: Lexers and Parsers“. Don Syme wrote “New Visual F# Templates for ASP.NET, Web API, MSTest and Nancy Now Available“. Maxime Rouiller published “Community Update (2013/12/12) – Static files in #OWIN, #Fsharp templates and more as well as One #ASPNET“. gab_km posted “Let MailboxProcessor Act“. Simon Dickson blogged “Nancy + F# = Fancy“. Ross McKinlay wrote “SqlProvider : SQLite support (experimental)“. First-class F# ASP.NET web templates are now available in VisualStudio. F# web templates for NancyFx via SideWaffle are now available! LinqOptimizer 0.3.8 is on NuGet. Intellisense on symbols is working is coming soon in Xamarin Studio. Pre-Alpha version of Vega Chart VS plugin is available here. Which F# community project has the best logo? 25 years of CPU work done in 3 days on medical research gene mapping using the power of Azure & F#. Support for untyped results (Map<string,obj> as a row type) in SqlCommandProvider was released. Foq 1.4 (mocking library for F#) was published on NuGet. “Understanding the World with F#” by Tomas Petricek. “Domain Driven Design with the F# type System — NDC London 2013” by Scott Wlaschin. Daniel Mohl posted “New F# Web App Item Templates“. Jamie Dixon wrote about “F# and SignalR Stock Ticker: Part 2“. Daniel Mohl wrote “A New F# ASP.NET MVC 5 and Web API 2 Project Template“. Matthew Moloney blogged “Inter Exchange Bitcoin Arbitrage (Excel Dashboard with FCell)“. Steve Gilham posted “An introduction to Functional Programming in F# — Part 1 : Functional Programming via circuits“. JetBrains blogged “Getting to Know Dmitri Nesteruk: Quant Finance and Developer Tools“. Richard Minerich shared “IPython notebook backed by an F# kernel“. Michael Newton posted “Type Providers From the Ground Up“. Simon Dickson wrote about “Owin: The Myth, the Monad“. Scott Wlaschin posted “Domain Driven Design“. The Swedish Coder shared “One hour a day 118: Podcast on F#“. Don Syme blogged “Slides for “Making Magic with F# Type Providers” at NDC London“. Keith Bloom wrote about “F# in Finance conference“. F# 3.1 Compiler/Library Code Drop was announced! Don Syme presented Xenomorph Type Provider. FsProjects(F# Community Space for incubating open community projects) was formed. New release of SqlCommandProvider and docs. F# binding auto-complete running in SublimeText 3. All existing StanfordNLP NuGet packages were updated up to v3.3.0. 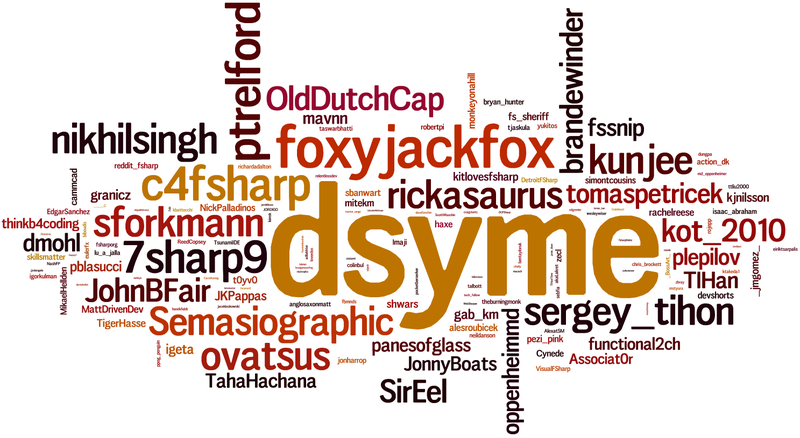 FSharp.Owin has a new name – Dyfrig. Use F# in Excel without Tsunami! Code Editor is now part of FCell! Simple web servers with Suave. New F# introductory programming class to be taught at Bellevue College starting 1/25. New cross-functional (F#, Haskell, …) meetup group was formed in Copenhagen. Ryan Riley ‏is working on a big change for Frank-fs and would appreciate any feedback. Which F# community project has the best logo? Vote by replying to this tweet. “Simpler Data Access and Smarter Calculations” by Paulmichael Blasucci. “Intro to F# pattern matching” by Stephen Olsen. “Using F# to change the way we work” by Jon Harrop. “F# and Financial Data Making Data Analysis Simple” by Tomas Petricek. “F# in the cloud” by Yan Cui. “Calling and extending the F# compiler” by Don Syme & Tomas Petricek. Xenomorph blogged “Putting the F# in Finance with TimeScape“. Cyan By Fuchsia posted “FsUnit and Visual Studio 2013 “Could not load file or assembly ‘FSharp.Core, Version=4.0.0.0 …’“. Jamie Dixon wrote about “F# and SignalR Stock Ticker Example“. Vasily Kalugin wrote “Silverlight F# (Fsharp + XAML) application. Access to WebCam using only F#“. Don Syme blogged “Putting the F# in Finance with Xenomorph TimeScape: A World of Financial Data at your Fingertips, Strongly Tooled and Strongly Typed“. Don Syme blogged “How to contribute to the F# support in Xamarin Studio, Emacs and more“. Don Syme blogged “Microsoft’s “F# in Finance” in London – Initial Report“. Christoph Rüegg wrote “Test Your C# or F# Library on Mono With Vagrant“. Daniel Mohl posted “Adding New Items to a Pure F# ASP.NET MVC/Web API Project“. http://www.geekswithblogs.net published “Running Session Scripts with F#“. Antonio Parata wrote about “Words permutation for passwords generation“.